Summary: The Scarlet Letter meets Minority Report in bestselling author Sophie Jordan's chilling new novel about a teenage girl who is ostracized when her genetic test proves she's destined to become a murderer. My Thoughts: Oh My Gosh! I loved this one! It will probably end up being one of my favorites of the year! What an interesting concept and so crazy to read about. We are introduced to Davy who is your above average teenager. She gets good grades, plays music, has a wonderful family, awesome friends, and a hot boyfriend. Her life is pretty good. Things are pretty clear cut for her. She’ll have a nice future. Until one day the results from a test everyone took at the beginning of the year. By this point, the test is a long ago memory. The test was to see if they had a genetic component for the kill gene. What this means is that she is capable of killing and they predict that she will. Everything for Davy changes in an instant. Once people find out, they want nothing to do with her. Her best friend turns on her instantly. She goes from loving Davy to absolutely hating her. She loses her best friend, and mostly everyone else in her life. Even her family is a little scared of her it seems. And her boyfriend, arrggg! Davy gets put in a new school; a public school. But she really only gets confined to one room, a room with others like her. She’s expected to do her work and graduate. I wanted to cry when the deal with the tattoo came up. Heartbreaking! But things change, and Davy gets sent away to a camp with others like her. It’s basically a training camp to make Davy use the kill gene for better things, more productive things. While Davy was in the new school she made a few friends. I especially liked Sean. Sean was such a good guy even though he came off as a badass sometimes. He really cared for people. Sean was probably the biggest highlight of the story for me. Even though I loved the idea of this, I also really loved the characters. Great character development. I loved seeing things from Davy’s point of view, and I loved seeing how she had to deal with things. And of course, the cliffhanger! OHHHH!! I need the next one now! I loved this one to pieces! Overall: Loved it! I hope I enjoy the next one in this series just as much! I adored this one! The plot was interesting and had awesome characters. I loved both Davy and Sean and even all the other secondary characters. I loved that Davy and Sean would do anything for one another. I loved this one! I hope you do too! Cover: Its so pretty! I love the girls long hair and I think this is a neat cover! 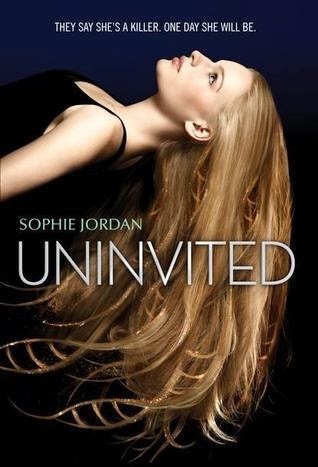 The Uninvited seems like a pretty cool original concept so I've been dying to get my hands on it. Glad you enjoyed it!